Silent Samurai Video Slot Guide & Review - Casino Answers! Silent Samurai is a 5-reel, 9-line video slot developed by Playtech, featuring wild symbols, scatter wins, multipliers, a gamble feature and a free spins bonus game. 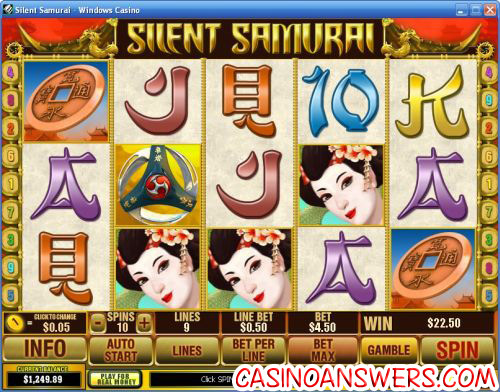 You can play the Silent Samurai video slot at Titan Casino and Vegas Red Casino. To start playing Silent Samurai, set your coin size at one of the following values: $0.01, $0.05, $0.10, $0.25, $0.50, $1, $2 or $5. You will then have the option of playing from 1-10X your coin size (or 1-10 coins) to determine your line bet. Then, you can keep the number of active paylines at the maximum of 9 or decrease it if you wish. The lowest total bet you can make on the Silent Samurai slot game is $0.01, with the highest bet being $450 – certainly enough of a betting range for any slots player. To play 10 coins with all 9 paylines, use the “Bet Max” button. To play with your own wager, use the “Spin” button to spin the reels. To win the 5000 coin top jackpot on the Silent Samurai slot machine, you must hit 5 Golden Dragon symbols on an active payline. The Golden Dragon symbol is Silent Samurai’s wild symbol and will substitute for all symbols except for the scatter and bonus symbols. The scatter symbol is the Geisha. If you hit between 3 to 5 Geisha symbols anywhere on the reels, you can win from 5 to 100X your total bet. If you hit the Samurai symbol on reels 1 and 5 at the same time, you will trigger the Silent Samurai bonus game and win 5X your bet. There will be three rows of ninjas. You will have to hit them to reveal free spins and multipliers. If you hit a Magic Ninja, three more ninjas will be taken out and you will be awarded their prizes. Once you hit an Evil Ninja that does not explode, you will exit the bonus game and start playing the free spins. Instead of triggering a bonus game during free spins, you will be awarded 8 more free spins. You can win up to 27 free spins with an 8X multiplier. After any win on the Silent Samurai slot game, you can use the gamble feature to double your win. In the gamble feature, you must guess whether the facedown card will be red or black. To exit the gamble feature at any time, use the “Collect” button to take your winnings home. While the top jackpot is nothing special, the main highlight of Silent Samurai is its bonus feature. It is easily triggered and you can easily clean up using it. It doesn’t hurt that there’s also a gamble feature that you can use to win a whole lot more as well. To play the Silent Samurai video slot and many other exciting video slots, visit Titan Casino! Are players from the United States able to play the Silent Samurai video slot? Unfortunately, players in the USA cannot play the Silent Samurai video slot. For a similarly themed video slot that you can play at US-friendly Vegas Tech online casinos, we recommend you try the Naughty Ninjas slot game at Millionaire Casino. Are there any other similar slots to Silent Samurai at Playtech casinos? If you like Silent Samurai and want to try a different game with the same sort of flavour, you might also enjoy the Ultimate Fighters Video Slot. Where can I play a Silent Samurai Flash game for free? You can play the Silent Samurai Flash slot game for free at Vegas Red Casino. You can play for real money as well. If you experience any issues with the Flash game, make sure you have the latest version of Adobe Flash Player installed on your computer. Where can I get a great signup bonus to play the Silent Samurai video slot? You can get a €4,000 welcome bonus to play the Silent Samurai video slot along with 100 other online slot games at Titan Casino. For full details on what is offered at Titan Casino, please read our Titan Review. Are there any asian slot machines? Are there any asian themed slot machine games?